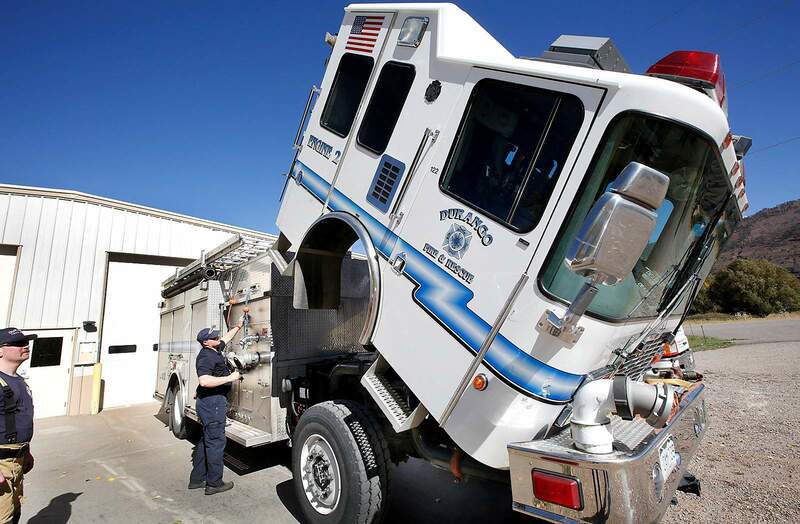 Volunteers with Durango Fire Protection District check equipment on a 1998 rescue vehicle that has 100,000 miles and 9,000 hours of operation. A campaign urging voters to support a property tax increase for the fire department has raised about $4,000. Brock Fortson, a volunteer with Durango Fire Protection District, must check fluids and perform maintenance on this fire engine. Colorado Secretary of State records show that some Durango Fire Protection employees donated to a campaign to support a property tax increase. 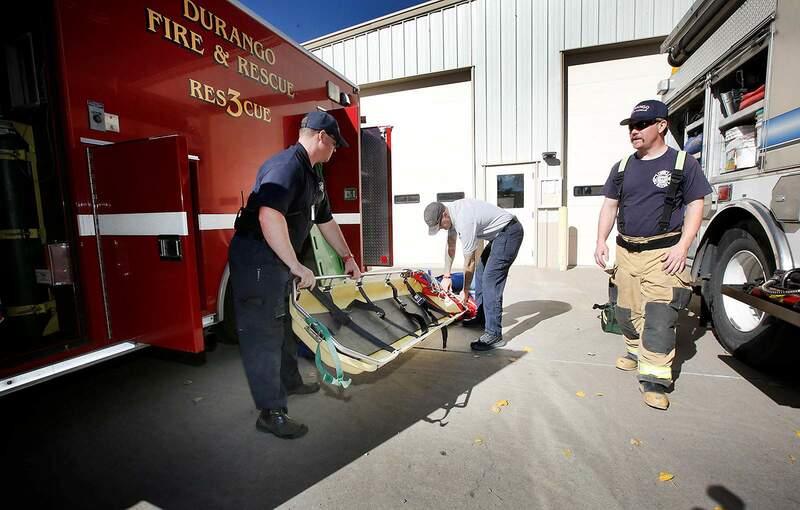 The campaign urging voters to support a property tax increase for the Durango Fire Protection District is running on a tight budget. The Yes for Durango Fire committee reported raising $4,000 through Oct. 12, according to the Colorado Secretary of State’s Office. Thus far, the campaign has spent $1,535 on banners and yard signs, documents show. It’s a grass-roots campaign with a focus on reaching people on the friend-to-friend level, Campaign Coordinator Beth Lamberson said. The campaign printed 110 yards signs, which were distributed in two days, she said. The campaign received contributions from 13 donors, and all but one had a La Plata County address. Most gave donations between $100 and $500, documents show. Some donors, including Fire Chief Hal Doughty, are employees of Durango Fire, but they were not asked to donate, Doughty said. “We didn’t pass the hat,” he said. No campaign costs have been paid for out of Durango Fire’s budget, he said. Fire district employees and volunteers are allowed to participate in the campaign, but they cannot do so while on duty, he said. Videos posted to Durango Fire’s website and Twitter account tagged “#understanddurangofire” are meant to inform people about the district and are not part of the campaign, Doughty said. The videos will be used to recruit and educate residents about Durango Fire when the campaign ends, he said. “We try to do a really clean line between providing factual information to the voters and having a group of people that are out there encouraging people to vote for us,” he said. Recent campaign efforts have been focused on Facebook and YouTube. On weekends leading up to the election, volunteers will be knocking on doors of registered voters in more populated areas of the county such as Durango West, Dalton Ranch and Edgemont, Lamberson said. The campaign committee’s goal is to raise $10,000 to cover costs including radio ads and Lamberson’s services, Doughty said. The League of Women Voters has been unable to identify any organized opposition to the property tax measure, chapter spokeswoman Trish Pegram said. What will a fire property tax increase buy?